It’s “Untempered Schism” which I’m not quite sure what it refers to, not as up on my Doctor Who as I should be. But the bag! The bag is awesomeness!!!! It opens up to say, “It’s bigger on the inside!” If you want one for yourself, please go here. And nobody wanted to link to me (last post)…I so sad…no really…I mainly did it so I knew how to do it…but still….makes me feel like that lone girl standing on the wall at the high school dance…. Today, we melted in the classroom, holy heck! I can’t wait for the cooling breezes of actual fall..
Now off to watch Terra Nova…the Hubs thinks it’s gonna be Jurassic Park without the budget….I can’t wait! Welcome to my blogging area…. A small portion of my Wizard of Oz collection. All were gifts, except the Barbie. It is one of the more collectable ones and not one of the mass produced ones. I wanted the whole collection, but only managed to get Dorothy. This is the top shelf of the bookcase that is next to the computer. The bookcase is filled with teacher resources and one shelf of crochet books/patterns. The doll was brought back from Vietnam by my father in 1971. I just started collecting sheep. Behind the sheep are more Wiz of Oz figurines. The other lunch box, which I have used. The Wiz of Oz board game, and tucked in front is a piece of art I won from a blog. I don’t have a spot for it yet. So do have clutter around your blogging space too, or is it neat and pristine?…..Why don’t you share…hey maybe I’ll start a linky thing! On Sunday I ventured to the Coventry Farmer’s Market. One day I year, it is also a fiber market, the Fiber Twist. It is held on the grounds of the Nathan Hale Homestead. some fleeces, look at this beautiful Jacob’s fleece! I bought the Hubs: Kettle Korn, fair trade coffee, and a hickory red raspberry syrup…. There was not as much yarn as I thought there was last year, but Rhinebeck is coming! We can remember and celebrate those heroes who lost their lives on that day. As I said in a previous post, The Wizard of Oz is my all time favorite movie. I have also come to enjoy Wicked, the Musical. Although I must confess, I never finished the book….. There are three costumes on display..
I’m heading back today, because they have prize raffley thing going on…You have to collect 5 witch stamps from different places in the mall and then you are entered to win Wicked stuff….I got three last night before I was so tired, I was falling down…the deadline is tomorrow…. (try writing your own Where I'm From poem) It is inspired by George Ella Lyons. I have two versions that I have been working on for awhile, but just finished this one..
See these two socks. The first sock I ever started was that green one. The pattern is from Tsarina of Tsocks and the Tsocks 101 pattern…I finished the one, although there is a definite difference from where I stopped and picked up again. I started and completed the Knitmore pattern before I completed this one sock. And I had some help from Wife, “Mom”, Knitter on my first heel flap and gusset. Then I took up the knit a pair of socks during Sock Summit weekend challenge and made one Jaywalker (Rav link). I have now cast on and ripped back the second Jaywalker at least 4 times. I can’t get the DD and the F/B to line up….. The Tsocks 101, I just cast on the second sock and I cast on correct and messed up the cuff…”Face Palm!” Instead of the P3, K3, I did P2, K2 and had to rip it all apart…. So I’m ready to put them both in timeout for awhile….any other easy first time sock patterns to try out there? I think I might cast on my first toe-ups…. some yarn…the winggirl is checking it out in her new cowgirl hat…I did not buy any, instead I bought a bag and LOTS of food, a birthday gift and some food to gift to others…. Yesterday I received my last Random Fandom package from Nerd Girl Yarns. 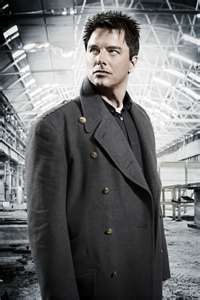 If you don’t know Jack, you should…Jack is luscious…and played by John Barrowman, who is also luscious and sings! He was born in Scotland, but lived in America and mainly speaks with an American accent, but sometimes he brings out the Scottish one....oh my! Captain Jack will shag anything, but John is out and proud and in a long term committed relationship. After I posted, I realized I didn't put any actual pictures of Captain Jack, it was all John...here's some Captain Jack! When I sit at the computer, I am surrounded by yarn…literally…I just moved the bag of handdyed green and black yarn that has been at my feet (under the computer) for the past week. So there is many a times I will just pick up a skein of yarn and sit it on my lap and pet it while I’m online. I know there is no way I can ever use it all…..but it just feels so good to pet it!